Working with the Elektron Octatrack has gotten back into sampling big time. Some of the things you can do with an Octatrack – like per step automation – can also be done with Ableton Push when working in "Note" mode in drum racks. Adjust params to your liking. 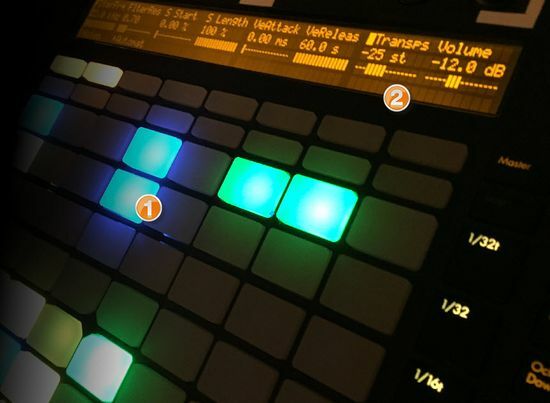 In this example I'm changing the pitch of each step in the step-sequencer. You can of course record real-time automation by simply pressing the "Automation" button when in record or overdub mode. Below is an example audio snippet I put on soundcloud of doing such that. I sampled audio from random needle drops on vinyl into clips and used them to build a custom drum rack. I then improvised using Push to perform and sequence these clips including per step automation of various parameters.